The sociologist Rabi Ray once explained the origins of advanced mathematics in tandem with the origins of melancholia. How does one fill time when time becomes nothing? How many books can you read, write, walk through? How many round bookshops do you swirl around and how many dogs do you feed on your way to passing, bypassing and creating time? How much of it is work and how much of it the mathematics of melancholia? Does time change across the city and between cities? Does it move faster or slower when you walk? Samprati Pani is a social anthropologist, who walks. She walks to get milk, then again to feed dogs, to get samosas, and to learn from local bazaars, flyovers and metro stations. Is she walking to do things or is it that things get themselves done in walking? Is she calibrating the city, or does the city exist through her? She writes of little things on the street—shops, objects, creatures and conversations—her walks revealing to us ordinary forms of inhabiting the city, the self and time. Sarnath Banerjee is a trickster walker and collector. He tricks himself and others into walking, collecting books and ‘extra’ conversations. Some of these grow into becoming beasts, some into books. In his new book, Doab Dil, he collects stories, cities, genealogies and people. Sometimes he walks with them and sometimes through them. He walks with Kierkegaard walking through an idea in his drawing room. But then is this walking or collecting? Do we measure time by collecting or through walking? Monday’s session is a conversation on ways of measuring time, cities and histories, a calibration of two modes of storytelling and ‘extra’ conversations. 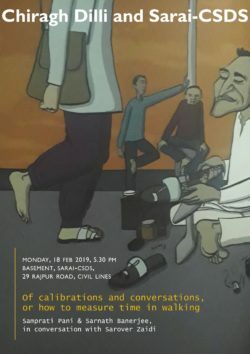 This event is co-hosted by Sarai-CSDS and Chiragh Dilli. About Chiragh Dilli: The blog explores, discovers and suggests ways of seeing the city, steering clear of grand narratives and singular representations, while experimenting with forms of writing the city. Chiragh Dilli traverses the dense, textured and complex everyday of Delhi, tripping on its spaces, languages and tales, from small talks of the streets and painstakingly meticulous observations of past chroniclers to the bustling weekly bazaars and congested alleys of the city. Sarover Zaidi is a social anthropologist, working on religion, architecture, craftsmanship and urbanism. She currently teaches at the Jindal School of Art and Architecture, Sonipat.